Trump, in turn, has often supported and joked about violence against reporters and the media, going so far as to praise Rep. Greg Gianforte after he allegedly threw an American reporter to the ground in the final days of his bid for Congress. After the attack, a Trump campaign official suggested that the attacker had been drunk. Skeans was accompanied by BBC's Washington producer and correspondent, Eleanor Montague and Gary O'Donoghue. 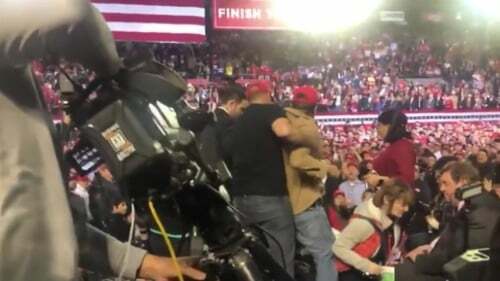 Montague tweeted: "Just attended my first Donald Trump rally where my colleague BBC cameraman Rob Skeans was attacked by a Trump supporter". It takes seconds (we don't even need your address) and every dollar helps. As the MAGA-hat wearing man was being pulled away, the crowd could be heard chanting, "Let him go!" Montague said that the shover attacked other news crews but that Skeans "got the brunt of it". He continued his speech after Skeans returned the gesture, the BBC said. "Wow, look at all the press back [there]". At the time, Trump was touting recent economic numbers to a roaring crowd in the El Paso County Coliseum.